Good afternoon and evening. I wanted to offer a quick update on Houston’s rain situation, as well as Invest 95L. The Flash Flood Watch that had been in effect for the region has been cancelled. We did see some significant rains southeast of Houston this morning. We do expect more rain and thunderstorms to develop tonight, but the heaviest should primarily remain offshore. That said, watch for locally heavy downpours in spots and at times, especially southeast of Houston along the coast tonight and tomorrow. Some short-fused street flooding can’t be entirely ruled out. But we don’t expect widespread issues tonight or Wednesday. With storms offshore tomorrow morning, inland showers and storms will probably be a little sluggish out of the gate, but do expect at least a few downpours tomorrow around the region. Eric can narrow this down with a little more specificity in the morning. We’ll see more scattered storms on Thursday, and we’ll pin that down for you a little better tomorrow. The National Hurricane Center (NHC) has boosted odds of Invest 95L developing in the Gulf to 70% this afternoon. After analyzing all the model data today, I am beginning to think this system will primarily be an issue for folks down the coast from Freeport. I do expect scattered rain and thunderstorms in the Houston area on both Friday and Saturday, with the heaviest activity likely along the coast. If Invest 95L develops, it would likely become a depression or weak to moderate tropical storm. The Euro model today did show this pretty well as it headed toward the Corpus Christi area or just south of there. The map below takes the 51 members of the Euro ensemble and basically creates a “heat map” of where most members take the system. In this case, you can see most are very well clustered on a path toward the Coastal Bend or South Texas. It’s also worth noting that models continue to push Invest 95L inland, meaning the “stall” scenario we all dread is likely not a major concern with this system. A word of caution: We still haven’t seen this system form a surface center yet, so depending on exactly if and where that develops, that could yield changes in this forecast for Houston (either positive or negative ones). So stay tuned to the forecast into the middle of the week to find out about any of those changes. In terms of rain? Remember, tropical systems aren’t points on a map; they have impacts far from the center. Along and substantially north of the path of this system, we expect 3-6″ of rainfall with higher amounts on Friday into Saturday. I would say that is most likely from Corpus Christi up through about Matagorda County. 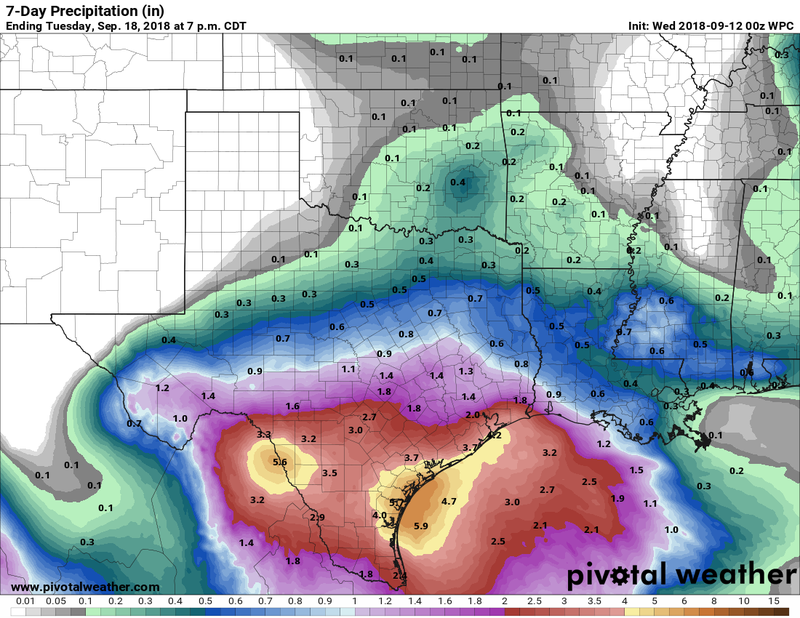 North of there and into Houston, additional rains of 1-3″ seem likely, with lesser amounts north of Houston and at least low risk of higher amounts south of I-10. Risk of a depression or weak to moderate tropical storm in the Gulf have grown since this morning. But based on all data we have today, the track of this system is likely to stay to the south of Houston, closer to the Corpus Christi area. 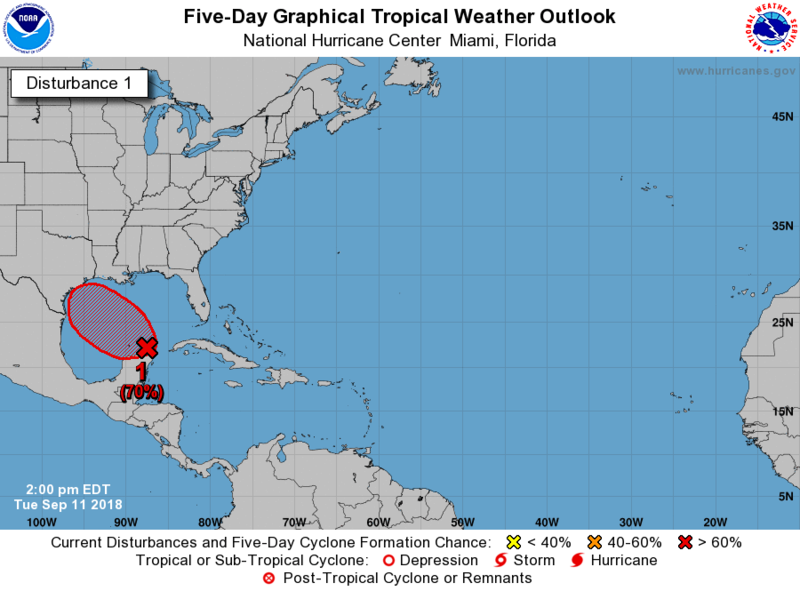 Impacts will occur well away from the center of the system, and in Houston that will likely mean primarily some rainfall on Friday and Saturday. Locally heavy rain is possible along the coast and mainly to the south of Houston. Widespread flooding is *not* anticipated at this time. Whatever this disturbance does, it will likely keep moving inland over the weekend, away from Southeast Texas. Yes, this forecast can change, so stay tuned just in case, but this is what we’ve got to work with now. Not much new to add on Florence, except that the “stall” scenario remains very much in play there. Rainfall amounts are stomach churning right now for parts of North Carolina. For anyone interested, I created a Twitter list of folks I know or trust to give good information on Florence. You can follow that here. Eric will have the latest for you on all the storms out there in the morning. Excellent, concise update. Thanks for all you and Eric do! As always, no hype, and great information. Thanks, Matt and Eric! Thank you for the weather update! I read them everyday. 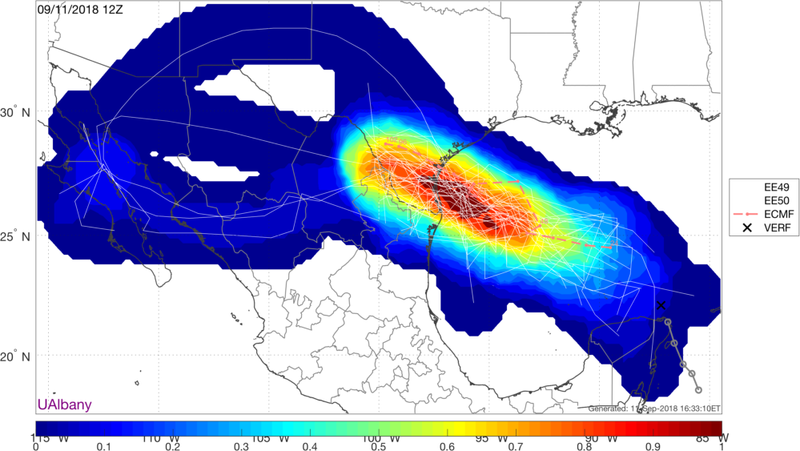 Models still showing it disintegrating in Caribbean or plowing into Central America. CMC has it strengthening and beelining for Houston. You guys are the best, seriously! Thank you for the twitter list for Florence. Thank you for all that you do. You are keeping me sane amidst Harvey flashbacks. Could you comment on Friday or Saturday as to the drought condition of north Texas? Thanks. Thank you again Matt for your time this evening and the updates! We will certainly continue to watch in case the rains come to Houston but for tonight my dear Fulgencio and I eagerly await peaceful sleeps after our hearty dinner and wines. Thank you for the concise information. We appreciate your time and hard work. I’m headed to Savannah, GA on Thursday. Thanks for keeping a loop on Florence going. Thanks again guys. We really do appreciate what you do. We love your educated and sane analysis. Do you know of some one who does the same for people living in/near Charlotte North Carolina?